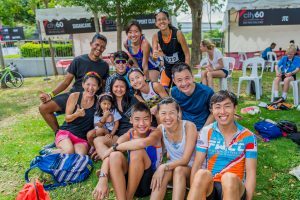 The second edition of the City60 Bike-Run Challenge cemented the event as a new iconic fixture on Singapore’s multisport calendar. The event welcomed 1110 participants, with 180 of them competing in their first ever multi-sport event. 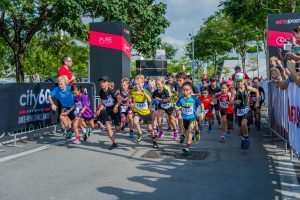 From the 76 year old participant to the youngest of 7 years of age, athletes of all ages and fitness backgrounds enjoyed the unique bike circuit on safe closed roads and the scenic waterside run. The most anticipated race was the headlining City60 contest, with the athletes setting the task of a 46km bike ride in between two 7km runs, to give a total of 60km in distance. The naming theme continues with the other three race distances on offer: the numbers in the City30, City15 and City6 events indicating the total distance cycled and run. Ali King and Jennifer Zenker reigned supreme in the City60, walking away with the top prizes on the waterside of the majestic National Stadium. 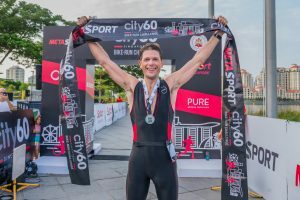 The UK’s Ali King led from the start of the bike to take the City60 crown by a margin of 2:21 to runner up and Singapore’s best Benjamin Khoo. 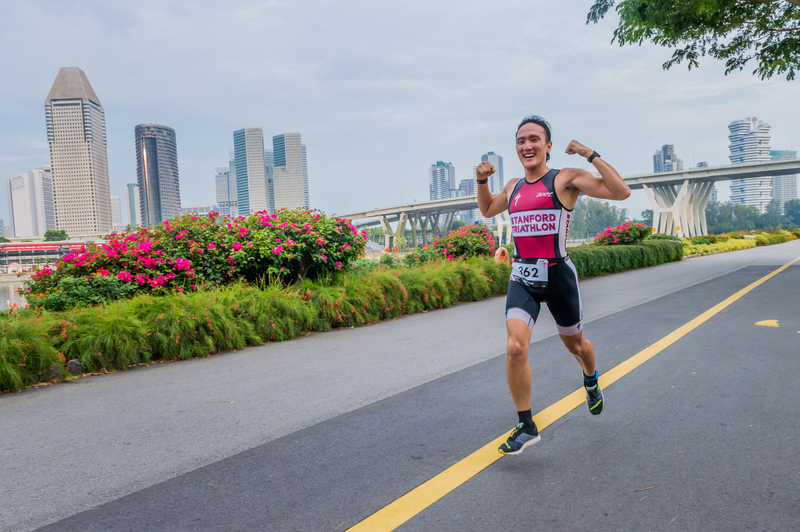 King had to work hard for his win as ex-national champion Lam Wai Kit took the field by surprise from the start by storming out of the gate and leading the race into transition by a margin of over 1 minute. King took over the reins on the bike and looked to consolidate his lead over a chasing group of 4 consisting of Gregory Britton, Tirthankar Datta, Damien Lavin and Benjamin Khoo. By the third lap of the bike phase it was Frenchman Antoine Loucheux who had raced past the chasing quartet and was reeling in King at a fast pace. Loucheux dismounted at T2 10 seconds from the tall Briton but ended up not being a threat to King on the run. King looked strong on the second run having seemingly paced himself well and extended his lead to win with a comfortable margin in the time of 2 hours 1 minute and 24 seconds. Benjamin Khoo ran to a 2nd place and UK-national Tirthankar Datta completed the podium. The women’s race was more predictable with a dominating Jennifer Zenker leading from start to finish to take the win for the second year. The German left Singapore’s Lim Baoying 9 minutes and 23 seconds behind. While history repeated itself for the top two places of the podium, it stopped there, and third this year was Denmark’s Janne Oldager who completed the podium another 4 minutes down. Sumiko Tan, who started in a later start wave, came close to pinching the 3rd place from Oldager, but had to settle for 4th. The City30 race was a competitive affair, with less than a minute separating Fabrice Petrissans, Chris Cook and Jerome Besnaud at the finish line. The women’s showed equally exciting racing with Valerie Yong running hard from the gun, leaving Dora Branyan and Melanie Keppler to fight it out for second and third placings. The Youth of Singapore put on a great athletic display in the City15. Billie May had a 15 second deficit on Muhammad Subair Mazlan after the first run, but a strong bike put him back in front, and he held off a fast charging Mazlan and Julian Lee in the second run leg to take the win by just one second. Lee was just three seconds adrift in third. Bella Shroff had a little more breathing room in the women’s City15, winning comfortably with a two minute margin over Nolwenn Feddall, and Sophie Grant a further four minutes back in third. The Kids had their time to shine in the City6 distance which involved a 750m run, 4.5km cycle and 750m run. Daniel Louw took line honours in the men’s race, 40 seconds ahead of second placed Julius Groenewegen who just held off Muhammad Akid Muhammad Najib who snuck across the line just 2 seconds behind. Philippine Hazard found some clear space taking the crown in 21 minutes 4 seconds, over a minute ahead of runner-up Claire Roberts who had a thrilling sprint finish to edge of Eva Petit by half a second. A special mention goes to Team Naise Boys made of Ben Moreau, Marica Muhammad Irsyad and Evan Chee, who set the fastest time splits on both the bike and the run course. The team completed the first run in an impressive time of 22 minutes and 39 seconds at a pace of 3:14 min/km. Their bike split was as impressive with cyclist Irsyad completing the bike course in 1hour 2 minutes and 48 seconds at an average pace of 41.2km/hr and winning the City60 Sprint Challenge, a race within the race, rewarding the fastest cyclist over a marked 1km stretch of the Nicoll Highway. Another race-within-the-race was the Negative Split Challenge, tasking the competitors with trying to go 60 seconds faster on their second run from the first, a tough challenge in a duathlon, so big kudos to winner Romain Thune for achieving a perfect negative split of 60 seconds. With the Civil Service Club as a key sponsor of the event, Singapore’s Public Service agencies had a strong representation. The Ministry of Education had the most participants and took home the Agency Challenge award, followed closely in second by the Ministry of Home Affairs! Each of the races had dedicated individual rankings for public officers and the City60 race had CSC Star Games points up for grabs for teams. The top honours went to SCDF, under the Ministry of Home Affairs. Members of training groups or clubs had the opportunity to earn points for their club. The top place in the club ranking went to New Moon KHCycle. 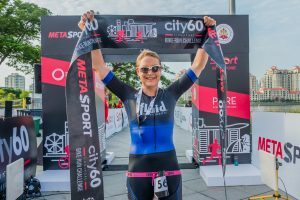 This event was the last opportunity of the year for clubs to earn points for the 2018 MetaSport Club of the Year award, an annual ranking of clubs taking into account all MetaSport multisport events, namely the MetaSprint Series, the Bintan Triathlon, IRONMAN 70.3 Bintan and City60 Bike-Run Challenge. MetaSport Club proudly took home the Club of the Year trophy for 2018. Post-race the attractive venue was full of buzz. The shaded, garden-like area, situated right next to the riverside finish line and in the shadows of the National Stadium, had booths providing free post-race massages, ice-cold drinks, a live results service and some photo opportunities in memories of the great achievements of the day. For full results and event info: http://city60bikerun.com/ .